With terrorism, war, HIV/AIDS, and famine in Africa… Aren’t you scared? Do you shoot animals on your safaris? Where do you go in Africa and what kinds of safaris do you do? Is going on safari dangerous? Will animals attack me? What do you eat in Africa? It must be so hot in Africa, how do you stand it? What about bugs and snakes? I’ve never been camping in my life – how could I manage on safari? Am I too young? Am I too old? Who goes on a Cowabunga safari? What shape do I need to be in? What clothes should I bring on safari? What gear do I need? What pills and shots do I need? When is a good time to go on safari? What animals will I see on safari, and how many? I’ve never been on safari, which one would you recommend? How much does it cost to go on safari? What does the cost of a Cowabunga safari include? What is a “typical day” on safari like? Why do you keep returning to Africa? Why do you have Cowabunga alumni who have been on safari with you over a dozen times? How large are Cowabunga groups? How has a small safari company like yours – with offices in Kansas and rural Iowa of all places, and a staff of only three – managed since 1974? Before we answer this question, we need to put Africa in perspective. Africa is an immense continent, not a country. There are 54+ countries in Africa encompassing a myriad of cultures, economic systems, histories, and languages. Africa has only about 15 percent of the world’s population but nearly 30 percent of the world’s remaining languages. The distance from its western tip to its eastern horn is farther than the distance from New York to Amsterdam. The continental United States could fit into Africa nearly four times over. To not go on safari in eastern or southern Africa to, say, Tanzania or Botswana, because of something that happened in West Africa, in Liberia for example, is like refusing to go to Canada because of something that happened in Mexico. Take heart: there is much that is “good” and “right” with Africa. These are the places we take our Safarists, not to war zones. This said, we do live in an era where, in the United States as well as abroad, the threat of terrorism lingers. Ultimately, it is up to each individual to decide whether he or she wants to give in to the goal of terrorists -- to live in fear and perhaps ignorance -- or to engage the world and to learn from others. Regardless, if terrorism were to occur, it would likely happen in an urban center; on safari we spend maximum time in “the bush,” not in cities. And always we at Cowabunga Safaris promise that if there is even the slightest chance anyone might be in any undue jeopardy on one of our safaris, we will cancel or rearrange the safari without hesitation. As for HIV/AIDS, the scourge of Africa, a person can contract it only in very specific ways… What kind of lifestyle will you lead in Africa? In the unlikely event an emergency blood transfusion is needed, our contingency plans include access to sterile needles and facilities where all blood is screened and medical staff are western-trained. Finally, about famine. Ironically, Africa can grow enough food to feed itself. The problem is distribution: many regions suffer because of poor or non-existent roads and rail links. Nevertheless, it is virtually impossible to lose weight on a Cowabunga Safari, so delectable is the fare and desserts! So now we return to the question, “Are you scared to go on safari?” No! Since 1974, we at Cowabunga Safaris we have made countless friends and had innumerable, wonderful experiences in Africa. Going to Africa and being on safari is a privilege. Yes – with cameras! We conduct photographic safaris only. Our safaris range from rustic to upscale. Tell us what you have in mind. We can make it happen. There is always an element of risk being on safari in some of the world’s greatest wildlife areas. However, you should not think of yourself as prey! Rather, you should think of yourself as a privileged guest in the animals’ home. As long as you observe certain rules while in your hosts’ home, they will all but guarantee you an enjoyable time. Our experienced guides make certain all Safarists know and follow “bush etiquette,” not only to get in respectful proximity of wild animals, but also to ensure the safety of humans and animals alike. Prior to departure, we thoroughly brief all Safarists. We also stay in constant contact with our many friends throughout Africa generally, and the countries we’re going to specifically, to keep apprised of everything from political events to animal movements. Once underway, we use only established, reputable airlines. In country, we make sure first-aid kits are within easy reach, and that staff trained in western basic first-aid are present. Beyond that, we have VHF radios and cellphones with which we can contact medical air rescue services. Finally, we have contingency plans in place for getting individuals from anywhere we are to a range of highly regarded medical facilities and western-trained physicians, all capable of handling nearly any ailment or condition. In Africa one can find penguins – yes, penguins! -- and wildebeest within kilometers of each other. So while there are hot parts of Africa, there are cold parts too. In East Africa, in places like Tanzania, Kenya and Uganda, all countries on or near the equator, the average elevation is 5,000 feet above sea level in most parts of safari country. This moderates temperatures, translating into ideal year-round daytime highs in the 70s or 80s, and nighttime temperatures in the 60s or 50s. The four seasons in East Africa are marked more by rainy and dry periods than by degrees: the short dry season, the long rainy season, the long dry season, then the short rainy season. In southern Africa, in places like Zambia, Zimbabwe, Botswana, Namibia and South Africa, seasons in safari country are likewise marked by rainy and dry periods. Yet depending on the line of latitude combined with elevation, one can have wide temperature variations also. In some of the places we go on safari it is not uncommon to be comfortable in a t-shirt and shorts during the day, but to need a coat, stocking hat and gloves at dawn, dusk or during the night. On a couple of safaris we’ve even had to contend with frost and snow! In sum, being too hot on safari is rarely a problem. In fact, an often-heard refrain around Cowabunga Safaris is that “Africa is a cold continent with a warm sun.” Layers, therefore, are a must. First-time Safarists are always surprised by how few insects they have to contend with while on safari. To some extent this can be attributed to timing: we tend to go on safari during the dry season, especially in southern Africa. While the reasons are more logistical – isolated bush camps can be reached by vehicle, animals congregate around remaining water sources, making for rewarding observations and photography – in terms of bugs, this is when there are fewest of them. Pleasant evening campfires also help in that they keep insects from “bugging” Safarists. Finally, all our safari accommodations are very comfortable and bug-free, if not bug-proof. As for snakes, we realize not everyone sees it our way, but you’d be lucky to see a snake on safari! This isn’t to say snakes aren’t around in safari country. They are. However, since 1974, most of our safaris have focused more on mammals than reptiles. In other words, with only a few exceptions, we haven’t gone out of our way to find serpentine creatures. More important to most Safarists, serpentine creatures haven’t gone out of their way to find them. In fact, we have alumni who have been on safari with us nearly a dozen times and have yet to see a snake. Some are getting to the point where they actually wish they’d see one! While we do conduct participatory, backpacking safaris on request, the bulk of our safaris are more upscale. You’ll stay in first-class lodges similar to what are found in, say, Yellowstone National Park. Most tented camps are anything but what you might find on a weekend camping trip in the USA. The tents are large – they are big enough to walk into and stand in -- with comfortable twin beds, complete with linen and duvets, and other furniture. Unless otherwise stated in our itineraries, all accommodations have private en suite bathroom facilities, including hot showers and toilets (yes, even in the tents). Some places even have filtered swimming pools. Depending on the type of safari you choose or ask us to custom design, your mode of travel might be in an open land rover, a van with a pop-up roof for photography, on foot, by canoe, motor boat or chartered light aircraft, or even in a hot air balloon! We cater to all abilities, comfort levels and interests. Tell us the kind of safari you’re interested in. We can make it happen. Since 1974, we’ve had 88-year-olds, college students, families, best-selling authors like Ken Blanchard, public school teachers, and children (albeit we have a lower limit of 14 for most mixed groups) from across the United States and several other countries go on safari with us – and the list could go on. In short, we’ve shared Africa with people of all ages and from all walks of life. The health of these people has run the gamut. We consult closely with every potential Safarist to make sure his or her abilities, comfort levels and interests are compatible with any given safari or group, whether the safari be rustic or upscale, participatory or not. As a general rule, Safarists should bring only the bare essentials: binoculars (the most important piece of equipment in our opinion -- at a minimum, we recommend 7x35s), camera, plenty of film or large memory sticks, three or four changes of casual clothes in “bush colors” (i.e., khaki, browns and greens – but no camouflage! ), a wide-brimmed hat, sunblock, swimsuit, a broken-in pair of comfortable walking shoes, and a pair of flip-flops/water sandals. A warm jacket is a must. Cowabunga provides in-depth written briefings for all Safarists after they sign-on for any safari. Furthermore, when possible, Cowabunga conducts face-to-face briefings approximately three months before departure. For those who can’t make the face-to-face briefings, a detailed transcript of questions and answers is sent to them. Gary, Brian and Nancy always stand ready to brief Safarists at a moment’s notice via fax, phone, e-mail, or in-person. In most parts of eastern and southern Africa, you should take anti-malaria pills and get hepatitis shots as a precaution. A few countries still require a yellow fever vaccination or a signature from your doctor waiving you from such a vaccination (we cover this distinction in the briefings). All Safarists should consult with their local public health clinic or personal physician regarding pills and shots. As soon as possible! Any number of things could change and keep you from going: politics, personal finances, age, health, airfares, etcetera. Some of life’s biggest regrets are missed opportunities. 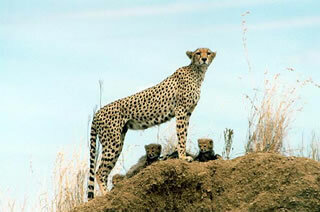 In spite of what many guidebooks say, any month is a good month to go on safari in East Africa. We’re serious. This isn’t just a sales pitch. Daytime temperatures are typically in the 70s or mid-80s for highs in most parts of safari country, and mid-60s (but occasionally the 40s) for lows during the night. During “the rains” it does not rain 24/7, usually only for a short period during the morning and afternoon, meaning that most roads and trails remain passable. Quality game viewing is a given year-round in East Africa due to the sheer number of animals present in the region. Elephant, lion, hippo, hyena, giraffe, zebra, baboon, warthog, gazelle and antelope we can guarantee. Cheetah probably, leopard perhaps, and rhino maybe, among other species. Birding is always phenomenal. On most safaris we see around 40+ mammal species. In terms of sheer numbers, we should see many hundreds, if not thousands, of mammals in southern Africa, and upwards of 10,000 mammals in East Africa! This question is a difficult one. It’s like asking a parent with a couple of children which child is his or her favorite. We love all our safaris for different reasons. Regardless, we’ll need to consult closely with you to consider timing, cost, abilities and interests. As a starting point, perhaps we should give some “big picture differences between southern and East Africa, the parts of the continent where wildlife viewing is most rewarding. In southern Africa we typically have opportunities for combining a wide variety of activities during one safari: treks and walks (at a pace set by the individual), game-drives during the day and at night (in open vehicles with no sides and no top), canoeing and/or boating on the Zambezi, and even horseback riding. Our camps in southern Africa are often isolated and small, sometimes capable of accommodating no more than eight people (which is fine, because unless otherwise stated, Cowabunga groups rarely have more than 10 Safarists, and custom-designed safaris can have fewer still); frequently elephant, cape buffalo, and other animals pass directly through them. The landscape in southern Africa includes the rugged Luangwa Valley, an extension of the Great Rift Valley Escarpment, the mighty Zambezi River, the remote Mavuradonha Mountains, the captivating Cape, and incredible Victoria Falls, the largest curtain of water in the world. As has been mentioned elsewhere on this website, East Africa continues to possess not only some of the last great concentrations of animals left on earth, but also diversity. 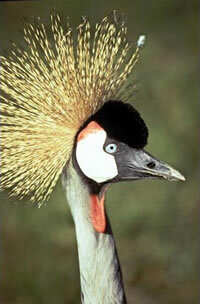 Rare is the East African safari where we do not see 46+ different mammal species and 200+ species of birds. Furthermore, there is a cultural dimension to being in East Africa that is unmatched -- as one would expect from a region with 148 different languages, Christian, Muslim, Hindu, and traditional religious influences, etcetera. In terms of topography, our safaris range from highlands in view of snow-capped peaks (Mt. Kilimanjaro, Mt. Kenya, the Ruwenzori Mountains), to semi-arid regions, to montane forests, to expansive savannah such as the Serengeti and the Maasai Mara, the northern extension of the Serengeti ecosystem – often in the course of one safari! These areas are most often explored in vehicles, but can in some instances be covered on foot, horseback, or even by hot air balloon. While we can never promise what a group will see, we have no hesitation saying that if we started counting animals from the time we arrived in East Africa until when we departed, we will see more than 10,000 animals -- and this isn=t allowing for repeat sightings of certain individuals. The cost of any safari can vary widely, depending on the destination, size of group, activities, types of accommodations, whether one travels during high or low seasons, or if it’s a private, custom-designed itinerary. At a minimum, you should probably plan on a two-week safari costing you anywhere from US$3,500 per person and up for the “land only” part of the safari, to which another US$1,500 to US$2,000 per person or so needs to be added for airfare. (The cost of airfare to and across Africa reflects the distances involved and the relatively few carriers that serve the continent.) Ironically, adventure camping sometimes -- but not always -- costs more than staying in upscale camps and lodges, a reflection of the difficult logistics involved. So what does your money buy you? Unlike some safari companies that lure people in with cheap advertised prices only to force clients to reach into their wallets for every other thing once they are in Africa, Cowabunga safari prices are straightforward. What you pay covers all professional driver/guide services, accommodations and meals as listed in our complimentary itineraries, entrance fees, transport in Africa with guaranteed window seat, even tips for porters and wait-staff at scheduled meals. We want you to enjoy Africa, not to be burdened with doing math and doling out dollars while you are there. Additionally, in-depth discussions about “African C.C.B. and Triple T” – in Cowabunga code, this means “African cultures, critters and birds, and trees, tracks and turds” – are included, as are (funny?) jokes on the part of the Safari Leader. Actually, we don’t know if we’ve ever had a “typical day” on safari in over thirty years. However, a “common routine,” if you will, might be to wake up to birdsong at about 5:45 a.m., get dressed, and to meet the rest of your group for hot tea or coffee around the campfire to ward off the morning chill. You then board your vehicle or lace up your shoes and venture off with your professional guide into the bush, usually in time for sunrise. The first light of day just before sunrise is a magnificent time as Africa is coming alive and the animals are active. You may need a sweater or light jacket at this time. You will seek to photograph and/or observe animals (and trees, and rivers, and mountains, and valleys, and clouds…) until 8 or 8:30, at which time you return to camp for a hearty breakfast. You then have some time to yourself until about 10:30 when you depart once again. You return to camp at about 12:30 p.m. and a luncheon buffet is served around 1. You then have the early part of the afternoon to yourself. This is the warmest part of the day (this said, temperatures will usually be no higher than the 80s at most in safari country), the time of day when many animals are simply “lying up” in shade. Some people utilize this time to take a nap, catch up on journals and field notes, clean cameras and code film, read, or even explore the environs around camp to add additional birds, animals, plants, and flowers to their check lists. At 3:30 or 4 you board your vehicle or lace up your shoes again, returning to camp by about 6:30 p.m. when the sun is setting. After a hot shower and change of clothes (laundry service is generally available at every camp and lodge), you proceed down to the campfire for a “sundowner” drink. An exquisite dinner is served around 7:30, and by 9 you’ve had a full day and you’re ready for a good night’s rest – if only the night sounds of the African bush would let you sleep! In the distance you can hear lions roaring, hyenas howling, hippos snorting… You might lie awake for some time, not out of fear, but out of fascination and awe. It is now when you might pinch yourself to make sure it is not a dream. You are actually in Africa on safari! Imagine a couple coming to the United States for the first time. They make a two-week trip to the state of Arizona and see the Grand Canyon. They then return home without seeing Niagara Falls, or the Olympic Rain Forest, or the Rocky Mountains, or the Florida Everglades, or Yellowstone National Park, or Denali National Park, or the Sonoran Desert… Could one say they’ve seen the United States, yet alone the continent of North America? Africa is much larger than North America. One needs a lifetime, not just two weeks, to experience a fraction of the continent’s infinite beauty and endless diversity. Even if you go back to the same destination in Africa more than once, it is never the same. A visit to the Serengeti will differ depending on the time of the year, the season, the annual cycle of the rains, etcetera. We’ve been there when the grass on the open savannah is a rich brown and the baobab trees are so devoid of leaves their branches look like exposed roots. We’ve been there when the plains are covered with lush green grass and the baobabs are so full of leaves you can’t even see their branches. In the dry season the sky is so immense that it goes forever from one horizon to the other – bright blue with a big ball of sun traversing it through the day. In the rainy season you see dramatic thunderheads forming in the distance and large sheets of rain moving across the plains. Africa is always changing. In fact, we’ve been in Tanzania where we’ve seen all of the above in a two-week period! One can never get bored returning to Africa. Unless otherwise stated, our groups rarely exceed 10 Safarists. Custom-designed safaris can have fewer still. The answer to this question starts with our people -- VERY SPECIAL PEOPLE – including family, volunteers (a.k.a., “Star Guards,” who mind our offices when Gary, Nancy and Brian are in Africa), friends, alumni of Cowabunga Safaris, and all of our associates in Africa. Without them and their support there would be no Cowabunga. All are valuable members of our team. What is more, these very special people give strong word-of-mouth recommendations, ultimately leading to a barrage of inquiries and contacts. We are overwhelmed by letters, e-mails and long-distance calls from potential clients who have heard of us through “a friend of their cousins.” In some cases individuals don’t even know what city they were calling or where they are e-mailing – they simply have a name and a phone number or an e-mail address. We never dreamed we would reach the point where some of our safaris fill two or three years in advance, and many have wait lists! Clearly we are doing something right. However, we should let you in on an open secret: for as good Safarists as we at Cowabunga Safaris are, we’re pretty poor business people! What’s that? Well… it is difficult to explain, but it has to do with how you structure a safari and share Africa with others so that a safari truly is the single most memorable travel event of a person’s life. We have seen the safari experience change numerous people’s lives for the better. It is this humbling fact that keeps us going – and the fact that we love being in Africa so much ourselves! --- Cowabunga Safaris is well-established; since 1974, we have conducted photographic safaris throughout Africa. --- Cowabunga groups are small; unless otherwise noted or requested, our groups rarely exceed 10 Safarists. Custom-designed safaris can have fewer still. We resist the mass tourism syndrome. --- Cowabunga Safaris is a small, independent company; this allows us to custom design safaris, from the rustic to the upscale. Tell us what you have in mind. We can make it happen. --- Cowabunga has had 88-year-olds, college students, families, best-selling authors like Ken Blanchard, and public school teachers go on safari with us – and the list could go on. We can accommodate nearly any comfort level, ability, or interest. It is a privilege to share Africa with one and all. Detailed itineraries are available at no obligation. Call, write, fax, or e-mail us. Better yet, pop into our Main Camp in Topeka, Kansas, or our Fly-camp in Clarinda, Iowa – we’ll break out the maps, brew African coffee, or have a sundowner drink, and talk Africa.